More workshops will be available throughout the year. Provident Street Youth and Community Centre. We are delighted to be offering workshops at this venue. Please use the contact form below to let us know you are interested in attending a workshop. tell us what you would like, Tai Chi, or Qigong, and why. weekdays, weeknights or weekends. Tai Chi Chuan - Practiced by the Emperor’s Bodyguard. The ancient Chinese art of Tai Chi Chuan is famous for being slow and being gentle, and above all good for our health. Few people know that hidden within the dance like movements are the locks, throws, traps and strikes of an elite fighting system; Tai Chi was one of the martial arts practiced by the Emperor’s Bodyguard. Tai Chi is part of a group of kung fu styles known as Nei Jia (internal School) and that classification is a clue to why Tai Chi can be effective as a fighting system, and as a health practice. Anyone studying a fighting system needs to be healthy, and fit, and that is why the practice of Tai Chi usually starts with Qigong. Qi Gong = balancing health; Create a healthy body and mind in harmony. 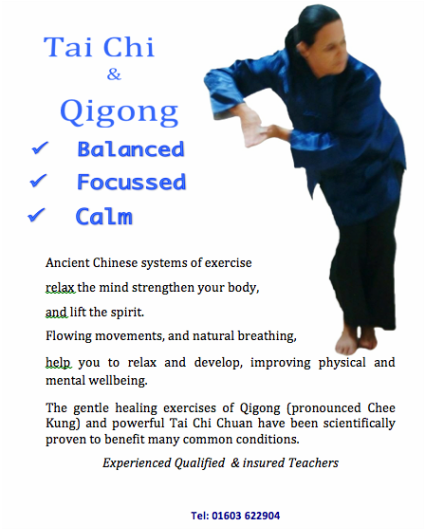 Qigong (pronounced chi-gung) is a system of healthcare, with roots over 5,000 years old. Translated as life force (Qi) and skill (gong), Qigong is the practice of moving Qi, or energy around the body to keep it in balance. Recent studies have shown a wide range of physical and mental benefits are derived from its practice..